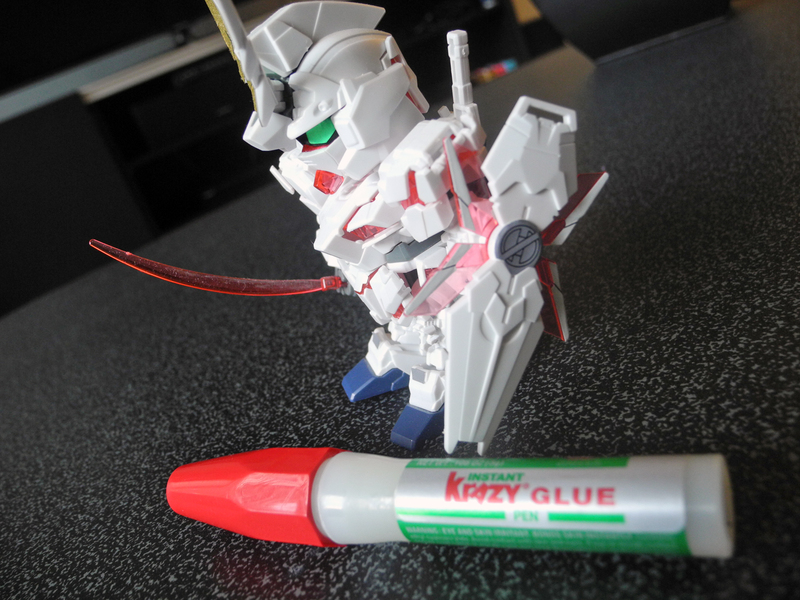 We try to be careful with our gunpla, we really do. But accidents happen. Things get dropped and broken, and although we didn’t mean it, we have to put them back together. 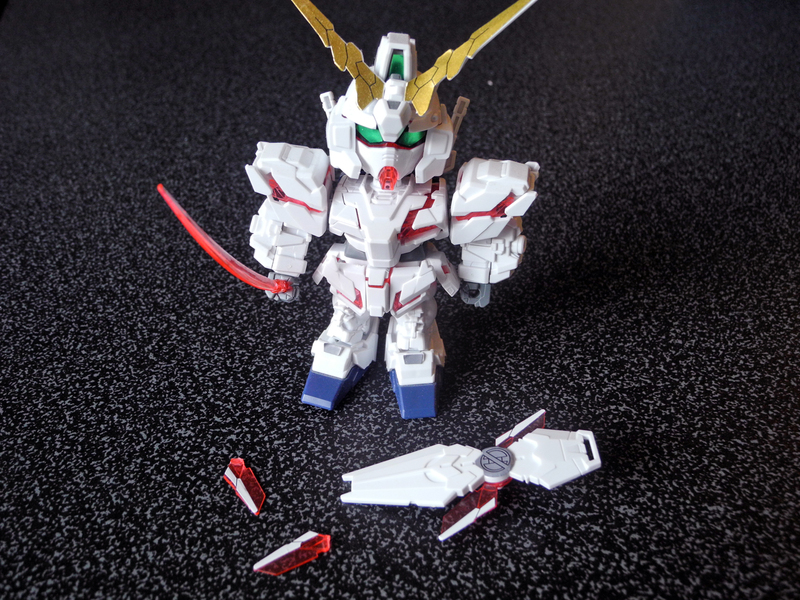 SD Gundam Unicorn is a victim of my cleaning sprees. Although he survived an earthquake we had a while back with no issue, that wasn’t the case for falling off a bookshelf. 1) Assess the damage. Are one or two parts askew, or did its arm become your puppy’s latest chew toy? The extent of the damage will govern the extent of the repair. 2) Fix small breaks with superglue. That’s what we did for Gundam Unicorn. This is standard glue you can get at the drug store. Lay your dust-free model on a paper towel. Then, dab the superglue on the part and hold it in place for at least 30 seconds. Leave the model lying down to prevent any falls while it is drying, and check in a few minutes. 3) If it’s really bad, buy a replacement kit. Sometimes there’s just too much damage to glue back together. One option is to buy a duplicate kit and mine it for parts. The best part is that, even if it gets broken again, you’ve still got tons of replacement pieces to choose from. 4) Alternatively, disguise it as battle damage. If the model is expensive or you just don’t want to buy a second kit, you could try to pass it off as the results of a Gundam battle. Distress it with a weathering kit to add sand, mud, or gunpowder wear, and maybe add some scrapes to other parts of the armor, too. 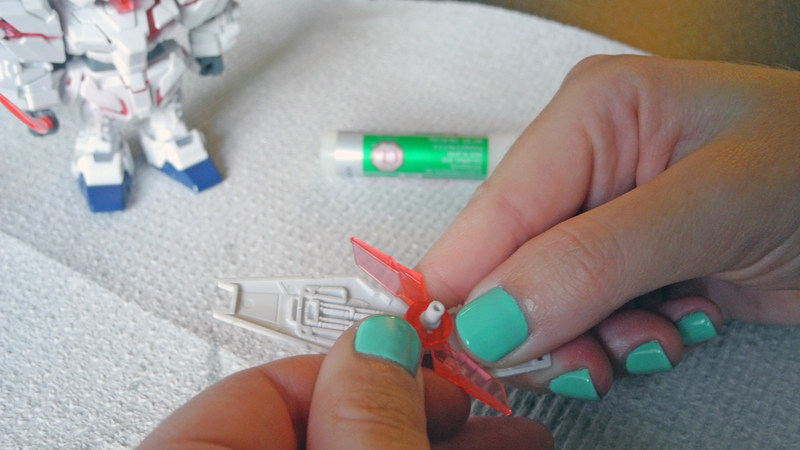 These are definitely not the only ways to fix a broken gunpla, and we’re always interested in hearing about the especially creative ways you’ve fixed up yours.